When you set the IsDefault property of a Button to true, the user can activate the button by pressing the ENTER key. The default behavior of a Button, however, will depend on which control in the window has focus when the user presses ENTER. If the control that has focus can itself handle the ENTER key, that control will activate when ENTER is pressed, rather than a Button that has IsDefault set to true. 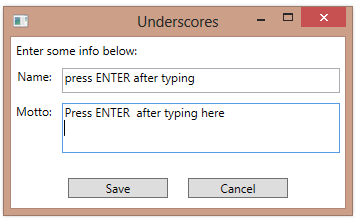 In the example below, the second TextBox has AcceptsReturn set to true and the “Save” button has IsDefault set to true. 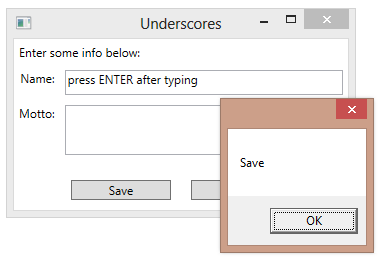 Because both the second TextBox and the Cancel button can themselves handle the ENTER key, the “Save” button will only activate on ENTER if the first TextBox has focus when ENTER is pressed.